Steam shrouds a Stanley as it starts out on a tour. Close-up of a Stanley Steamer. A volunteer starts the firing-up process that starts to build steam before a Stanley can be driven. Stops along the side of the road are all part of the touring experience. Tom and Ruth Marshall take the 1910 Stanley Touring Car Model 71 out for a tour. Residents of Hockessin, Yorklyn, and Greenville may have caught a glimpse of an antique car driving along the roads, puffing white steam as it rolled on by. Actually, you may have heard what sounded like the chugging of a train coming down the street well before you saw the cars. Propelled by a steam engine instead of the internal combustion engines of modern cars, these Stanley Steamers -- some more than 100 years old, others approaching the century mark -- are part of the Marshall collection at Auburn Heights. The 1915 Mountain Wagon is celebrating its 100th year. Guests can get rides in this car on Steam' Days. This is the world's largest collection of operating Stanley vehicles. The Marshall Steam Team, a group of dedicated volunteers, maintains and drives the 14 Steamers in the collection. These cars are driven on tours, in parades, to shows and special events, or just around the neighborhood for fun. 1. 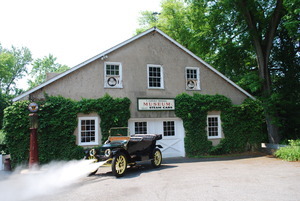 It takes a good hour to get a Stanley Steamer fired up to drive. There's no turning a key and off you go. 2. Stanley Steamers make a bunch of strange noises -- chugs, squeaks, and clunks -- as they move down the road. They are supposed to. Sit back and don't worry about it. 3. Stanley Steamer drivers must look at the gauges and make many adjustments. They keep track of steam pressure, air pressure, water levels and more, all while driving down the road. There is no power steering. 4. Have a water hose with you on longer tours. If and when you run out of water, you can't make steam, and therefore you can't go any farther. 5. Always dress warmer than you would otherwise. Without doors, windows, and a roof, there's a very good breeze that keeps you cool, at least when you are moving. In the fall, always bring one extra layer and a blanket -- you will need them. 6. Always wear sunglasses, especially if you are riding in a model without a windshield. Bugs and flying debris sting. I've learned the importance of windshields on modern cars. 7. Always secure your hat under your chin. It will fly off otherwise. If you don't wear a hat, expect to have a really bad hair day. 8. For comfort, Stanleys (and modern vehicles) with doors, windshields, windows and roofs are preferable. 9. Steam whistles are loud. Along parade routes, one must be careful not to blow them next to small children, as there will be tears. 10. Expect to spend at least part of a drive along the side of the road. These cars are old. Things happen. Most problems are resolved quickly. Rarely does one have to return via a modern vehicle towing the Stanley. 11. Upon returning from a drive, you don't just pull a Steamer into the garage and turn if off. Blowing-down is a long, noisy procedure to let out all the steam in the car before it can be put away. The Stanley 1913 Model 76 Touring Car is blown down after a drive in front of the Age of Steam Museum at Auburn Heights. In the early 20th century, T. Clarence Marshall ran a Stanley Motor Carriage Company dealership from his Auburn Heights home in Yorklyn. After the demise of the steam car industry, he began collecting and preserving the Stanley Steamers. He built a large garage, now the Age of Steam Museum, to house his growing collection. Tom Marshall, Clarence's son, caught his father's enthusiasm for steam power and continued growing the collection. Having this great resource in the Hockessin and Greenville community is possible because of the generosity of Tom and Ruth Marshall. In the late 1990s, Tom started working with a group of volunteers to pass on his vast knowledge of driving and maintaining steam-powered cars to a new generation. These volunteers became known as the Marshall Steam Team. New volunteers are always welcome. In 2003, the Friends of Auburn Heights was formed as a 501(c)3 non-profit corporation to support the work of the Steam Team. In 2008, the Marshalls gifted the Auburn Heights estate to the State of Delaware and its newest state park was formed. The Marshalls' collections were donated to the Friends of Auburn Heights. At 100 years old in 2015, the 15-passenger Mountain Wagon was the largest vehicle made by the Stanley Motor Carriage Company. It is the last known operating vehicle of its kind. The Mountain Wagon model was originally designed to carry passengers from the train station in Denver up into the Rocky Mountains to the Stanley Hotel in Estes Park, and found some success as a commercial vehicle. The Marshall Mountain Wagon was originally used to haul logs out of the woods in New Hampshire, before it was purchased by Clarence Marshall in 1946 for $1,700. Friends of Auburn Heights uses the Stanley Steamer collection as the basis for interpreting the emerging industrial age at the turn of the 20th century. They share their knowledge and allow the general public an opportunity to experience riding in some of these early vehicles. The public is invited to visit the estate for Steamin' Days, where there are rides around the house in Stanley Steamers, as well as train rides, house tours, and the Age of Steam Museum is open. Upcoming dates for Steamin' Days are July 5, Aug. 2, Sept. 6, Oct. 4, Oct. 25, Nov. 1, and Nov. 28. On Aug. 30, the Auburn Heights Invitational Auto Display will feature unique and rarely seem vehicles. This year's theme is Limousines and Landaulets. The event supports the mission of Auburn Heights. Tickets are now available, with details on the website. To volunteer, learn more about Auburn Heights, and/or Stanley Steamers, visit www.auburnheights.org.